Ordoro extends the flexibility of Shopify Plus, allowing it to support fulfillment models and supply chains that range from simple to sophisticated. Take orders that are fulfilled in different ways depending on their destinations, for instance. Let’s say you’re based in the East Coast. Shipping orders to the West Coast would be pricey. To cut down on shipping costs, you might choose to outsource fulfillment with a 3PL based in Kansas that stores inventory and ships only orders headed west. Outsourced or in-house, Ordoro supports both fulfillment models. The 3PL can be integrated with the app, allowing it to auto-route those westbound orders their way. For all other orders, you can use the app to create shipping labels and ship them from your own HQ. And as you scale, with more products and channels being added to your business, it’s more than possible to work with our API to construct any integration you need, whether it’s an up-and-coming sales channel, a new supplier, a 3PL, or a useful third-party app. Because each part of your enterprise connects to Ordoro, it also acts as a centralized hub for managing inventory. Whether you store it in your own warehouse or that of a third party, your product count will stay synced throughout every single integrated channel. Every fulfilled order is accounted for. Once product is sent on its way to the customer, the app will adjust inventory quantities accordingly and relay updated levels to every relevant channel like your sales platforms and 3PLs. Whether it’s the holiday season, a flash sale, or just steady growth, we’re your toolbox for cranking out many orders in a quick amount of time. One of the most time-consuming parts of a shipping workflow is filling out all of the necessary shipping information — like method, weight, dimensions, and insurance — to get an order from A to B. Shipping Presets take care of that. Ordoro’s Shipping Presets auto-populate an order’s shipping specifications. 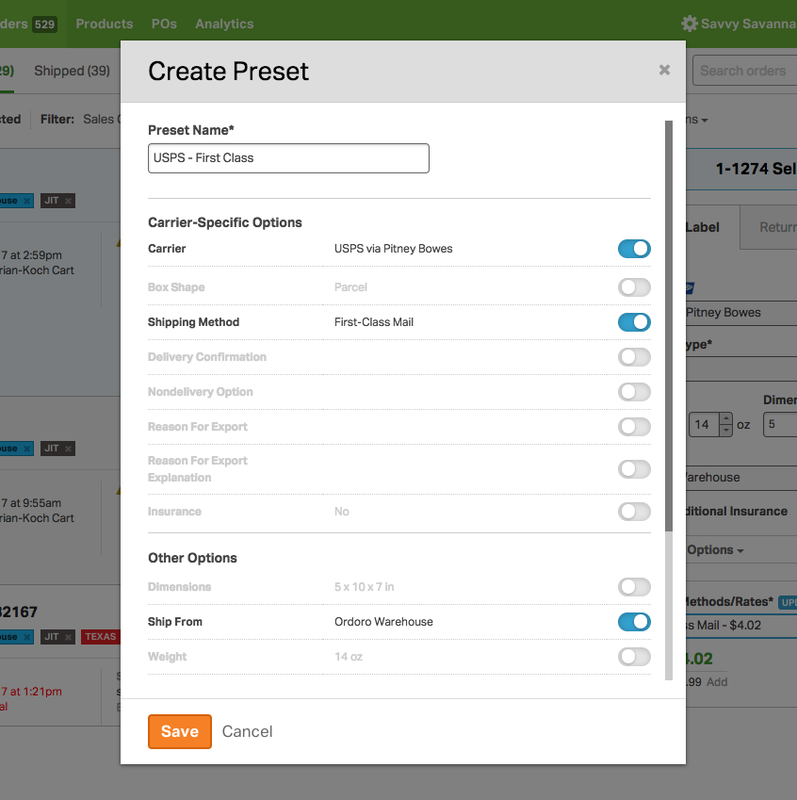 If you find yourself processing the same orders over and over, it’s easy to set up and save a preset that automatically completes the manual work of applying shipping options. 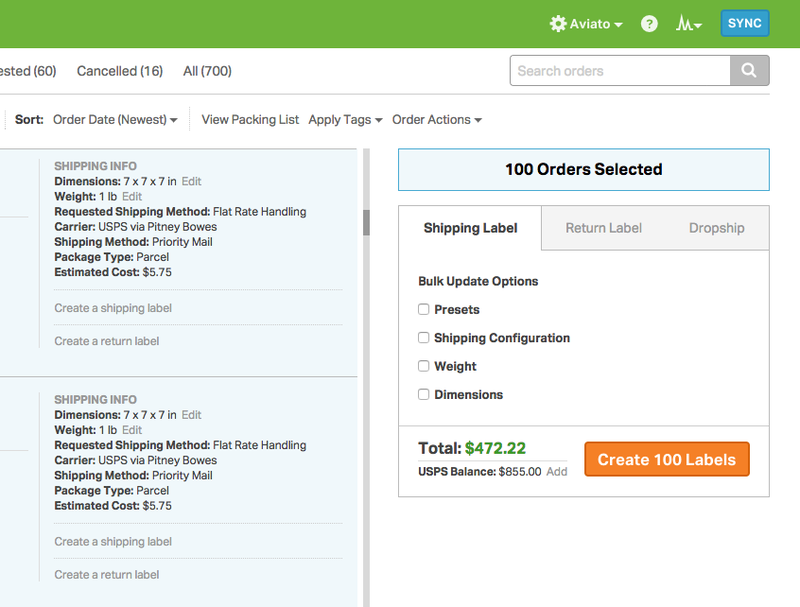 Tackle your high order volume in a matter of clicks through Automation Rules, a feature that automatically applies tags and shipping presets to your orders based on certain criteria. Here’s how they work: let’s say you ship higher-value orders overnight through FedEx. 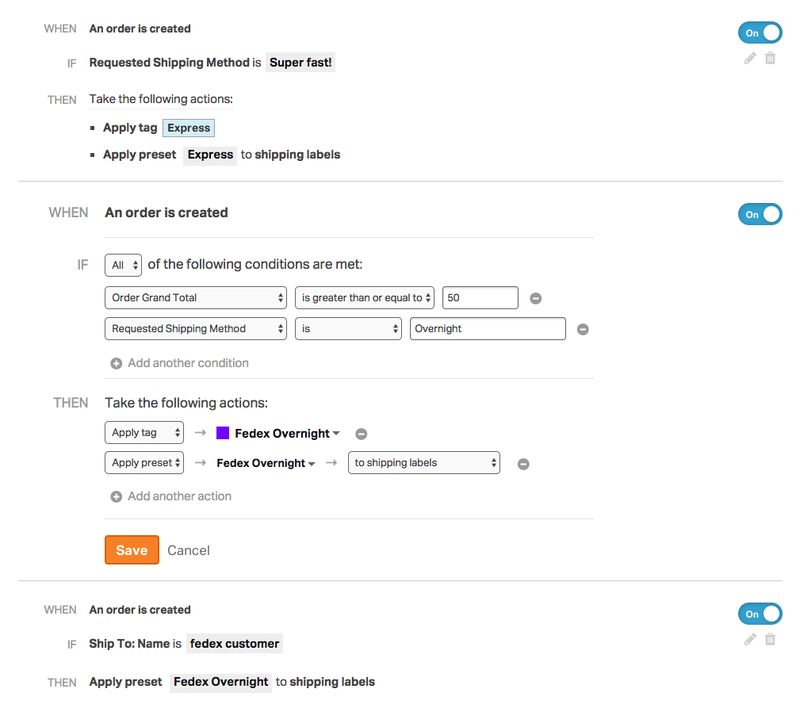 You can set up a rule that contains multiple criteria — if an order’s value is over $50 and the customer requests overnight delivery, create a rule that auto-adds a tag and a FedEx Overnight shipping preset to it. When it’s time to get those orders out the door, it’s as easy as filtering orders by the tag, selecting them all, and hitting a button that generates a shipping label for each. No inputting shipping info, no hunting down orders, no sweat. Plus, large order volumes can be taken care of in a small amount of time through the app’s batch processing capabilities. Once orders are prepared and ready-to-go, easily create and print shipping labels for them in large, triple-digit batches within a couple of clicks. Your dropshipping operation, large or small, is completely seamless and customizable with Ordoro — make it as automated or manual as you want. Let’s say you’re selling a wide variety of products on a couple of sales channels. Most are supplied by several dropshipping suppliers, but you fulfill some smaller, lightweight SKUs in-house. Ordoro makes it easy to juggle multiple channels and dropshippers, all while fulfilling on your own end as well. It’s only a matter of importing products, assigning the dropshipped ones to their vendors, choosing to manually or automatically route them, and waiting for a sale to make its way into the app. Some orders may contain a mix of SKUs fulfilled by separate dropshippers. If one arrives, the app will automatically split it up, sending a dropshipment request for each item to its assigned vendor. And if an order is placed that consists of multiple products, some of which are handled on your end, you can either manually or automatically split and route those dropshipped products to their appropriate vendors, all while fulfilling the others in-house. Instead of sending your orders to vendors, have them do the work on their own. Vendor Portals allow your dropshippers to enter Ordoro to view and process only their fulfillable orders. It’s business as usual — they can create shipping labels and tracking information through the app just like you — but it’s all in their hands. And to get a glimpse inside your suppliers’ inner-workings, set up some Supplier Feeds linking your vendors with Ordoro. Through them, you’re able to see just how much inventory a supplier has on-hand, helping you better understand whether they can meet your demand. Ordoro contains a few baked-in features that are major pluses for any multichannel Shopify Plus merchant. Ordoro unifies every every sales channel you sell on, particularly Shopify-related stores. If you sell on multiple Shopify Plus stores, even multiple Shopify POS systems, the app is your command center for all order-related matters. Running two independently branded Shopify Plus stores and selling on Amazon? Managing an offline store through Shopify POS while selling on eBay? Link every channel with Ordoro and handle every aspect related to orders — from shipping to inventory management — all within the app, regardless of where the order arrived from. The app plays well with Shopify POS. Alongside your Shopify Plus webstore, let’s say you’re selling in two different brick and mortar stores — each with its own warehouse — and you use two separate Shopify POS systems to process the sales you make offline. Once orders are imported through your Shopify Plus webstore, Ordoro can ID the POS an order was made on and assign it to that brick and mortar’s warehouse. Then you can pluck and pack the product from that store’s warehouse, ensuring that your inventory levels across every facility and sales channel stay aligned. Through Shopify Webhooks, Ordoro is also able to provide Instasync; the moment an order is made on any integrated Shopify channel, the app is able to import it. No waiting for a given period of time for imports, and no need to hit a button for immediate syncing. Once orders are placed, you can get to work fulfilling them in seconds. Just as Shopify Plus provides you with expert launch managers and support gurus, our five-star-rated Support Team is always at the ready to answer any of your questions or concerns. Want some voice-to-voice time to pick our brains? with us and we’ll talk it out. Want to learn more about our product features and workflows? Check out our Support Center. Book some time with one of our Product Experts to see Ordoro in action and to start your free trial.